There are full moons, and then there are Full Moons. Not every opposition between the Sun and Moon will stimulate like the opposition this week will. September 24/25 brings a powerful full moon that stimulates several major and important aspects. The Moon in Aries is conjunct Chiron, square to Saturn, and sextile to Mars. Aries is a sign that serves the Self. It represents the individuated ego, “Me”, “Myself”, and “I”. The aspects it makes trigger three long-term transits. Saturn, Uranus, and Chiron are all in the early degrees of new zodiacal energy, and the full moon acts to agitate our needs for change, and instigate our actions. Conjunct Chiron, the Moon illuminates the wounds of our egos. While we need our notions of self in order to stay functional in a world that requires self-differentiation, our individuated identities are also the sources of our deepest ignorance and suffering. Locked into our personal stories, we get caught in the endless loops of egoic patterning, and become separate from the natural world and our living connections. Surrounding the days of the full moon, and over the course of the next six months until the Aries new moon, we glimpse a preview of the coming nine-year transit of Chiron in Aries. Wherever Aries is in your chart, is a place where you must heal, learn, grow and become a resource and teacher for others through your own processes of ego integration. Both the Sun and Moon are square to Saturn in Capricorn, and Saturn, in turn, is trine to Uranus in Taurus. Saturn rules form, traditions, boundaries and rules themselves. Uranus breaks rules, innovates and experiments, liberates and revolutionizes. In the Earth element, these two powerful planets are pushing us to make long-term, lasting changes in the structures of our lives. The aspects from the full moon create friction with Saturn. Wherever Capricorn is in your chart is a place where you’re now pressed to move beyond stagnancy, to admit to your authenticity, and surrender your grasp on structures that no longer serve your growth and evolution. As you come into deeper alignment and integration, Uranus wants to help move mountains of possibility, and make space for freedom. The moon is sextile to Mars, and the Sun forms a trine. Over the course of the last few months, our inner warriors have been doing battle with old patterns and belief habits. Now we are ready to begin to implement the changes we long for. Change won’t happen quickly though, it will happen through repetition and discipline. Mars in Aquarius teaches us to repattern our nervous systems and practice with new programs. The aspects from the Sun and Moon suggest that our relationships are our greatest teachers. Learn more about this full moon astrology in my podcast. This podcast is a recording of a live talk in Berlin, Germany, given on September 23rd. To use this astrological energy, practice with my guided meditation. This meditation explores the relationship and axis between Self and Other, and offers tools for awareness of relational habits, and simple strategies for coming back to your own center when you’ve been pulled or pushed out of balance. Your audio horoscopes are below. 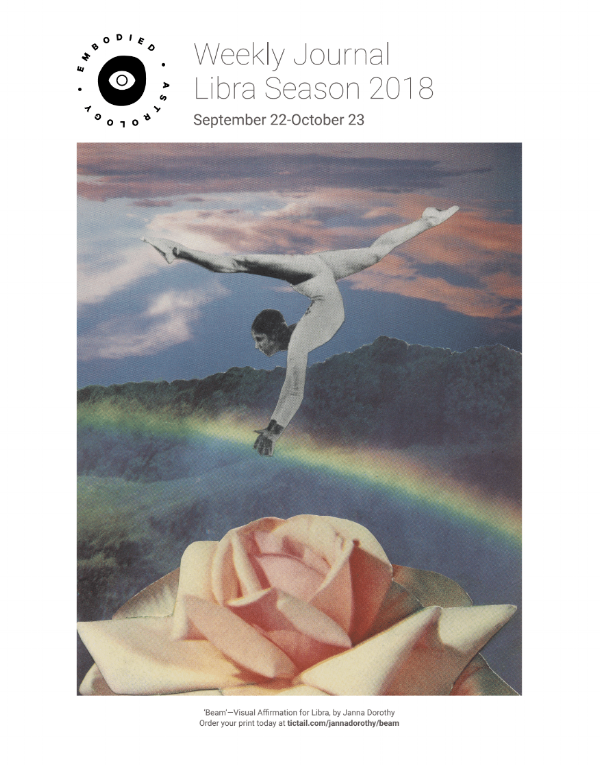 These horoscopes are for the full moon phase, September 25 - October 9, 2018. Listen for your sun to understand something about your inherent nature and ego, listen for your rising sign to understand more about what's going on in your life right now, listen to your moon sign to understand more about your relationships and emotional landscape. Horoscopes are poetic pieces of mystical suggestion. Take what works and leave the rest. Use the affirmations throughout the new moon cycle as questions, metaphors, and reminders. My Path and Purpose are supported and sustained through my relationships. Other people help me see my goals and attain them. I am the most satisfied and successful in my relationships when I feel my own agency and adeptness, and when I’m heading in the direction(s) that motivate and inspire me. Ego emerges from the Collective Unconscious. I come from everything that has ever existed, and know myself in limitless potential. My life here and now though, has specific meanings and reasons. I free myself from egoic attachments, and let the nature that I am meant to be flow through me. I open myself to unison and harmony through balanced discipline. Issues that have arisen, and which arise now, in my intimate and vulnerable relationships hold keys to my effectiveness in the world and my social standing. I clarify my boundaries, I advocate for my needs and desires, I am accountable. These ways of being ripple out into the world around me, and help support my dreams for the future. My relationships are freeing, satisfying, healthy, and joyful. I learn and grow with others. We exist in our evolutionary potentials. We don’t hold back from expressing what is true. We give ourselves fully to courageous love and friendship, where conflict can be productive, and our mutual health and happiness is the goal. Sensations of struggle, striving, and control are released as I recognize where my energy and attention are best spent. I graciously and gracefully make, and take, the space I need. I listen to what I know is true for me. I follow my inner guidance. Any activities, jobs, or routines that are misaligned with my guidance and truth fall away. Value begins at the core. What others perceive and how the world responds is a reflection of what’s inside. I remind myself to live like nature. I grow from the inside out, and let light pull me towards it. The best expression here on Earth is the one that comes from an honest heart. Other people are the teachers. The ways I feel in relationship to other people are the lessons. I look for the lessons on Ego. I look for the places where I build walls inside. I look for the ways I separate, and tell stories about who is friend or foe, and why. I remember my basic goodness, and my actual essence. The nature of my mind is a reflection of my environment and activities. Negative thoughts, crankiness, and stress show me what needs to be cleaned up and purified. I attend to my health and wellbeing by putting myself in places, and around people, that inspire and uplift me. In whatever ways I can, I clean up around me: in my thoughts and language, in my friendships and social connections, and in the neighborhoods and areas I occupy. I am who I am! I love what I love! I do what I do! I celebrate myself by honing in on what there is to give. Generosity is the key, and devotion is the practice. I cultivate and accumulate richness by offering richness. Spirit, make me your instrument. Move through me. My body is yours to live in. My voice is yours to speak through. My heart is filled with you, and my love is yours to give. I rest and abide in and with you. I trust that you are here. There is existence, and there is form. Forms come and go and are always changing. There are moments of balance, when a form can be defined by a name. Language then, becomes a limitation and a prison. Nothing is ever so simple as its name. Nothing will ever remain the same. Long-term investment strategies are successful when they are sustainable. Sustainability depends on everyone, not only me, myself, and I. What is actually important and valuable to me? What are my value systems rooted in? How do I, as an individual hold value?